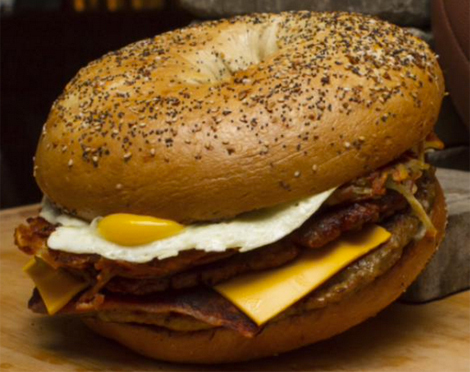 The 10-inch sammie is piled high with four eggs, two-and-a-half pounds of meat, potato hash, and more. 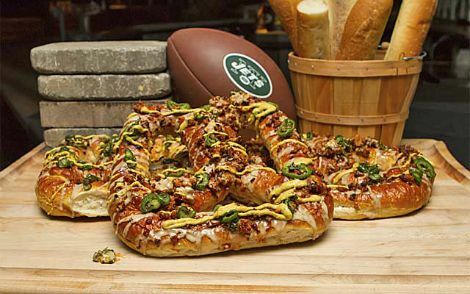 Football season is back, and with it comes gluttony in the form of over-the-top stadium foods—something the New York Jets are taking very seriously. 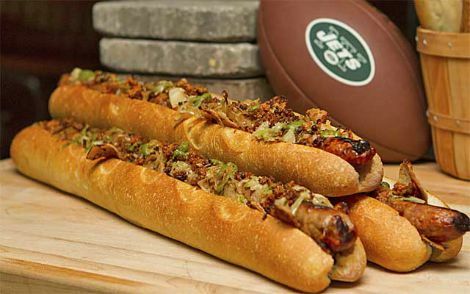 The Jets debuted three new snacks at this year’s season opener at New Jersey’s Meadowlands Stadium. The most impressive of the ‘Jumbo Jet’ concessions is a $50 breakfast sandwich that’s 10 inches in diameter and piled high with four eggs, two-and-a-half pounds of meat, potato hash, and more. The Jumbo Jet Breakfast Bagel, made by Delaware North SportServices, comes on an absurdly large everything bagel that looks like a prop from the land of the lost, and it’s topped with not one but three patties: a half pound of Taylor Ham (or pork roll, as it’s called in the great state of Jersey), a one-pound chorizo patty, and an equally large breakfast sausage. The mutant bacon egg and cheese also comes with four fried eggs, four slices of American cheese, potato hash, and a side of ‘Jet Fuel’ (a spicy green chimichurri sauce). ESPN reporter Darren Rovel gives word that the bagel will sell for $50 on game day, or in other words, the same price of one round of beers from the same stadium stand. If breakfast isn’t really your speed, Meadowlands Stadium’s concession team has you covered. Take a look at the rest of the items featured in the ‘Jumbo Jet’ package below.